Karin Sander’s body of work seems extremely disparate at first glance, bringing together works that seem very distant from one another, such as vegetables nailed to a wall or enlarged photographs from a mobile phone, taken at a random angle, but following a strict program. But upon a closer look, it always revolves around how a minor change in a state can create something quite different and new. Often, Karin Sander’s work are characterized quite accurately with the term “intervention,” for in an overwhelming number of cases they are centred not in themselves or in a productive activity that can typically be termed artistic, but are conceived as an intervention in an exterior situation that is subject to certain spatial and specific attributions and laws. Such is the case with a series of photographs taken on her mobile phone whenever someone calls the artist. The phone is programmed so that the camera switches on automatically when she takes a call. Thereby she has created a working method, following a set of “playing rules” that dictate how the works are created, while on the other hand, the result is beyond the reach of her influence to a certain degree. The result is a set of pictures of details that tell you both very little and a lot about a brief moment, about a defined place and its coordinates. When she takes a call, her phone immediately shoots a fragment of the chair in front of her, or it will take a picture of the floor, the feet, or her desk. The pictures are like the phone calls themselves. They happen unexpectedly, according to the principle of chance. But the photographs do not look random. They seem meticulously composed. When her phone rings, her first reaction is to look who is calling. And because she is distracted, she forgets that a picture is being taken at that moment. This means that while the pictures are generated by chance, this is still happening within a clearly defined framework. Karin Sander’s genius consists in coming up with ideas that might look simple, but lead to wonderful results. At least the ideas appear simple, though their realisation is sometimes a technically highly complex process that may take years to complete. But every time, the result is always a kind of magical mechanism that incessantly commands the observer’s attention. One could label Karin Sander’s art “so what art”. Most of it can be described in half a sentence, but as soon as it is realised and subject to our, literally, marvelling gaze, we cannot find words enough to describe it. 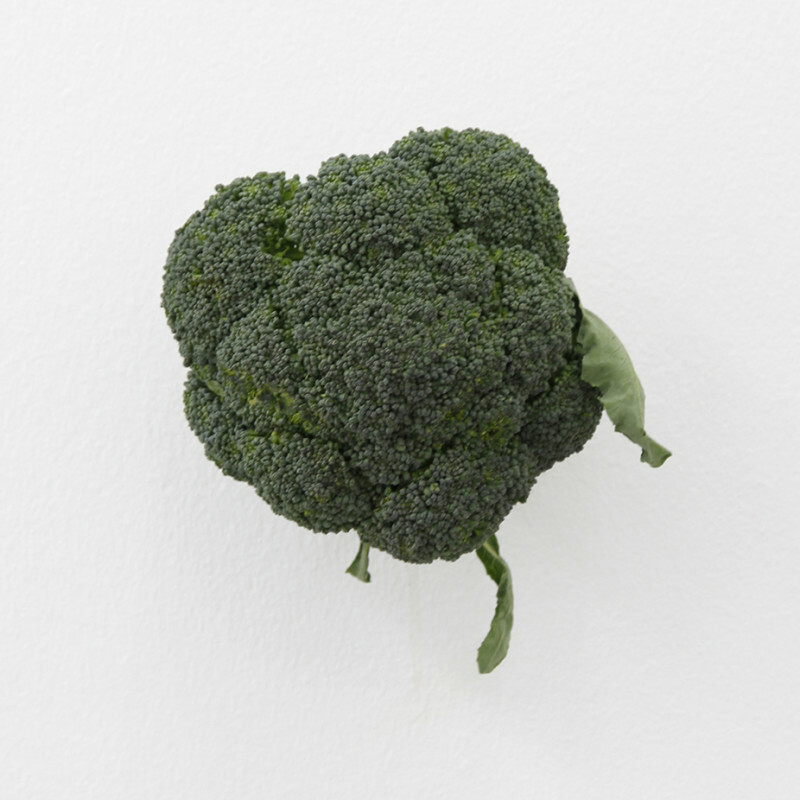 Karin Sander has nailed fresh vegetables to a wall. So what? Yes, dammit, you might well ask what ideas she’s trying to trigger off in our heads this time. In addition, the vegetables seem to be completely intact. Somewhere at the back they must have a nail stuck into them, but you can’t see any trace of it and the spectator may wonder if this is this all made of plastic, produced in the same factories that turn out garishly coloured artificial sushi for display? Or is it instead all hyper-real, doused in atomic radiation, creating bilious greens, brilliant reds and lemony yellows that exist nowhere in nature? The artist has disingenuously labelled these real vegetables Kitchen Pieces. Exhibited like this, they immediately pose like pieces of pop art, looking as if they were sprouting out of the wall and might any minute burst into song. Karin Sander is truly a friendly witch, with minimal effort making everyday objects appear so artificial that our mental processes and perceptive powers have no choice but to spring into action. Karin Sander lives and works in Berlin and Zurich. She has been Professor of Architecture and Art at ETH Zurich since 2007. Her works are in numerous collections including the Museum of Modern Art and the Metropolitan Museum of Art, New York; the National Museum of Art in Osaka; the Israel Museum in Jerusalem, as well as Staatsgalerie and Kunstmuseum Stuttgart. This is her third show at i8 Gallery. Karin Sander: Ausstellungskatalog / Exhibition Catalog. n.b.k., Berlin, 2011. Eva Menasse on Karin Sander’s Kitchen Pieces.